RESOLUCIÓN PARA LA PROVISIÓN EN PROPIEDAD EL CONCURSO-OPOSICIÓN RESTRINGIDO DE UNA PLAZA DE SARGENTO DEL SERVICIO DE EXTINCIÓN DE INCENDIOS, DE LA LISTA DEFINITIVA DE ASPIRANTES, DEL TRIBUNAL CALIFICADOR, DEL INICIO DEL PROCEDIMIENTO DE SELECCIÓN. EXPOSICIÓN AL PÚBLICO DELEXPEDIENTE DE MODIFICACIÓN DE CRÉDITOS POR CRÉDITOS EXTRAORDINARIOS Nº 05-01-2018 DENTRO DEL PRESUPUESTO MUNICIPAL DE 2018. EXPOSICIÓN AL PÚBLICO DEL PERÍODO DE COBRO VOLUNTARIO EL PADRÓN FISCAL DE TASAS Y PRECIOS PÚBLICOS QUE SE RELACIONAN. PROCEDIMIENTO ORDINARIO 413/2018 CITACIÓN A ROFEAL HOSTELERIA ABULENSE S.L. EXPOSICIÓN PÚBLICA EL ACUERDO DEFINITIVO SOBRE CONCESIÓN DE CRÉDITO EXTRAORDINARIO. CORRECCIÓN DE ERRORES DEL ANUNCIO DE INFORMACIÓN PÚBLICA DE SOLICITUD DE UTILIDAD PÚBLICA DEL PROYECTO DE LA PLANTA SATÉLITE PARA EL SUMINISTRO DE GAS NATURAL A LA LOCALIDAD DE PIEDRAHITA. 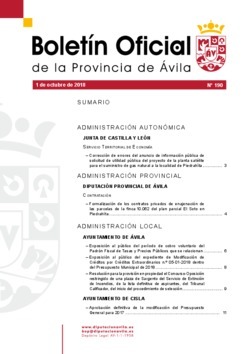 FORMALIZACIÓN DEL CONTRATO DE OBRAS DE URBANIZACIÓN DE LAS CALLES SANTO CRISTO Y LA FRAGUA DEL EXPEDIENTE Nº 4/2018. APROBACIÓN DEFINITIVA DE LA MODIFICACIÓN DEL PRESUPUESTO GENERAL PARA 2017. CONVOCATORIA DE NOMBRAMIENTO PARA ELEGIR LOS CARGOS DE JUEZ DE PAZ, TITULAR Y SUSTITUTO. APROBACIÓN INICIAL DEL PROYECTO DE MODIFICACIÓN DE LOS ESTATUTOS DE LA MANCOMUNIDAD. SOLICITUD DE LICENCIA AMBIENTAL Y URBANÍSTICA PARA UNA NAVE DE CERRAJERÍA.